GENERAL SANTOS CITY – The boxing card featuring promising knockout artist Jether Oliva has been moved to September 3 and will have a new venue, according to JC Boy Manangquil. 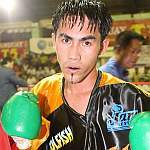 Oliva goes up against tough undefeated Paithong Muangsima of Thailand in non-title bout scheduled for ten rounds. Manangquil said Oliva’s first fight against a foreign opponent will be held in nearby Polomolok gym upon the request of Mayor Ed Lumayag who will co-promote the fight along with former world flyweight champion Gerry Peñalosa. World title hopeful Richie Mepranum, who was earlier reported to co-feature the boxing extravaganza is a doubtful starter as his manager, Maasim Mayor Jojo Lopez, still has to find a suitable opponent. Mepranum is coming from a long lay-off after a successful debut in the United States where he won against American Cesar Lopez via a six-round unanimous decision in the undercard of the Pacquiao-de la Hoya fight in Las Vegas in December but has not fought since his US debut. A protégé of Maasim Mayor Jojo Lopez, Mepranum is the reigning World Boxing Organization (WBO) Orient champion. He holds a 21-1-1 record and owns a win over current Philippine flyweight champion Rocky Fuentes. Muangsima reportedly holds a perfect 9-0 (win-loss) slate although www.boxrec.com has no record of any professional bout of the Thai boxer. The September 3 card will be light-flyweight Olivia’s third fight of the year, coming off two victories against Rogen Flores in February and March. Oliva is undefeated in 13 professional fights and has knocked out nine of his opponents. He is managed by JC Boy Mananquil of JM Promotions. Also seeing action in the undercard are Randy Petalcurin who will square off against Winie Bartiquil and Janjan Gello-ani who will face Jesus Jimenez. Froilan Saludar, Erwin Ancajas and Erwin Romasasa will also appear in the undercard. Their opponents will be announced later. Oliva, who is feared for his wicked body punching prowess, is currently the light flyweight champion of the Mindanao Boxing Federation.